parliament – Mark Loves History! The Gunpowder Plot. Several Catholic conspirators had hatched a plan to blow up the Parliament building in London while the king and parliament met. One of the conspirators told a relative not to attend, and that relative told authorities. On the night of November 5th, conspirator Guy Fawkes was caught lurking in the basement of the building, and subsequently 20 barrels of gunpowder he had hidden there were located. Fawkes named his conspirators under torture. Several, including Fawkes, were sentenced to be drawn and quartered. As Fawkes climbed a ladder to the gallows, he jumped to his death. Today is Guy Fawkes day in England, celebrating the failure of the plot. In recent years it seems to have become popular to don a Guy Fawkes mask to render yourself anonymous to protest anything from injustice to prices. Today in History, April 13: 1829 – The Roman Catholic Relief Act is passed by the English Parliament, topping of efforts at Catholic Emancipation in Britain. Irish Catholic Daniel O’Connell had won election to a seat in the Westminster Parliament the year before, but could not take his seat due to centuries old laws forbidding it. The Duke of Wellington and Sir Robert Peel, the Home Secretary supported O’Connell’s efforts to overturn the laws. Their support was mostly to prevent revolt, not necessarily out of sympathy (Peel had challenged O’Connell to a duel in 1815). 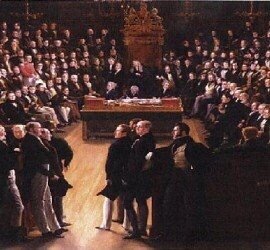 It took a threat of resignation by Prime Minister Wellington to gain passage in the House of Lords and Royal assent from King George IV.